It has been decided by the Filipino Japanese Movement for Global Peace executive officers and committees that there will be no mini-GPF to be done on the month of November. What was so appealing was the sincere voice of Ms. Marivic Arillo Mizushima to hold a Chiba mini-GPF. Barely a month Chiba team wasted no time in looking for the right avenues to jump start the event further. Worth checking out is the day of the event. A welcoming yet modest atmosphere of relaxed, inspiring emotion is apparent from the moment you enter the room. It feels a little like home. The event formally ignited by the invocation prayer uttered by Mr. Hector Vesillas. The passionate Marivic welcomed everybody and the special guests. Emphasizing that Chiba event is the last series of mini-GPF initiated by FJMGP and that everybody is invited on Nov. 15 for the first - ever GPF in Japan. She encouraged everybody to become peace advocators.2008 Global Peace Festival Video Presentation followed. A tribute to the successful GPF worldwide event astounded the viewers. Comes next a surprising intermission of a young lad Gerome Rara sung a love song entitled, "Before I Let You Go." Mr. Brian Dirige, an engineer by profession and the FJMGP- PRO, explained the purposes and goals of FJMGP, as what had been reported in the previous mini-GPF. 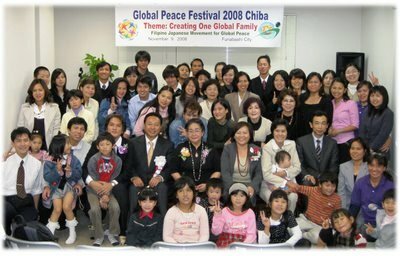 He further added that FJMGP was established only the month of April 2008, a toddler organization but was able to hold 15 mini-GPFs through-out Japan, garnered 2,000 plus Filipinos participated. FJMGP zoomed development and advancement hit wonder, as it reaped and even greater harvest of honor. Thanking everybody for the endless effort. An impromptu ability to come through, managed confidently when Mr. Roel Sison emcee the event at the spur of the moment. He tactfully introduce the keynote speaker, Ms. Angelita Obara, Pres. of the FJMGP and a Recipient of Ambassador for Peace Award. The ever dynamic speaker, gave an assuring idea and importance of what is GPF all about. GPF themes, activities, purposes were the main points clearly explained. Out in the podium, standing closely to the participants calling each one for unity to do service, to serve as peace - bridge not only to Japanese but to other foreign national as well. Present during the event was a prominent lady at 69. Madame Fanny Kyo, founder and Pres. of Filipino Wives of Japanese Association (FWJA) which aims to help a Filipina (generally the Filipinos) overcome the difficulties faced in daily lives as foreigner in Japan. A co-founder and a former Pres. of Association of Foreign Wives of Japanese (AFWJ), Producer and a choreographer. She has been a staunch supporter of the environmental cause that made her received a Parangal Show in Manila after exploring Mt. Pinatubo for her charity and voluntary work. Barrels of ink have already been spilled on her numerous achievements in all forms of production, as mentor in promoting Philippine Culture and heritage and as a leader for charitable activities. She delivered the inspirational message as if she's giving advice to her child. Her words contained valuable wisdom. She quoted, saying, “I’m very proud of you. Peace to be realized is coupled with love and service. It comes from ourselves, to family, nation, and the world. Love God and love our neighbors. Be friendly, give your heart and the only way to do that is to volunteer without complain and not thinking of money. I'm raising funds through fashion shows even going to the stations saying "Onegai shimasu" for funds. Money goes to the needy. If you want to do something please do it with a smile. " Her enhancing presence gave us all deep and compelling inspiration. Bouquet of flower was given to Madame Kyo by Ms. Obara and Ms. Mizushima an appreciation for her noble work.Certificate of Peace Partnership with the GPF theme song CD was awarded by Ms. Obara and Ms. Mizushima to the following organizations: Madame Fanny Kyo - Founder and Pres. of FWJA Mr. Hideyuki Ozawa - Director, Asian Culture Exchange Association ( ACEA ) HANA - President, Mr. Tamutsu Nakamura, NTT - Life Support Com. Ltd. - NTT representative, Ms. Lovernly Ronquillo. After thousands of heart - tugging messages. A simple but delicious snack was served. A perfectly chilled beverages of soda and fruit juices was a refreshing match to a well - flavored banana chocolate muffins.Coming up a family entertainment highlighted the event. A ballad song "Pagsubok" was sung by Jeron Okubo. The ever -committed partner of FJMGP, The Tong Il Modo, is on the top list participation to the series of mini-GPFs held through-out Japan. Thanks to Mr. Arnold Hiramis and his daughter Juna showing the Chiba viewers "The Form of Peace" a Martial Arts Ballet and later followed by the " Eye of the Tiger", duo of Ms. Obara and Mr. Hiramis. A one-two punch, highly spirited, received a loud W O W from the audience. The most awaited of all was the Philippine Ethnic Dances performed by the dance troupe of and choreographed by Madame Kyo itself. Tiboli - performed by Ian Tanaka and Marissa Tagena, was the most artistic dance of the Tiboli tribe. A dance of the four Datus' wives competing to each other. Particularly this dance is marked by intricate hands and arms movement along with shimmering costumes with dainty swirling hats to the sound. Manobo - performed by Judith Itoh, a ritual dance of the Manobo tribe during full moon for good bearing and harvest. Pangalay - performed by Judith Itoh, a muslim dance means to offer dance to the Royal Sultan. It depicts a group of women going through a motion of showing various way of wearing malong. Noticed that a single dress for these dances may feature as many as 10-20 different accessories from a very artistic feather - like headdress to a golden-brass anklets that sounds as the dancers elegantly perform the steps. In colorful costumes with slow and fast steps designed to bring out freshness and glow to the performers. The accompanying energetic beat of gongs and drums highlight the performers show off traditional steps creating a scene of joy among reveling audience. Truly a remarkable grace. After the ethnic dance rendition Ms. Itoh remained for a third-treat to the audience not a dance but a song to sing entitled, “Don’t Cry For Me Argentina." A song profiled and acclaimed in the music world as one of a kind and it was without a doubt demonstrated. The singer a professional indeed, had a pleasant voice.. Pleasant... and tender even. She performed a comical interpretation of the song made the audience burst into laughter and applause. This was how her sense of humor operated. All performers awarded by Ms. Mizushima and Mr. Katsuhito Ohina, a Certificate of Appreciation and a CD of the GPF theme song for their participation and splendid performance. Mr. Katsuhito Ohina, General Secretary of ACEA delivered the closing remarks. For the long overdue package, the raffle draw, a show toppings generally expected, is a special gift giving from the heart of the FJMGP Chiba Chapter. Chiba event started at 2:15 pm ended around 5:30 pm with a participating count of 68 people. Needless to say, preserving the precious memories, a picture taking with the Chiba family and guests, stamped the foundation of success for Chiba GPF never be erased... Forever. After the event with a view of serving. A just-enough meal was served to the remaining staff and guests. An array of fried chicken, paella and a touched of Japanese cuisine of nori-maki and inari. With a full service staff to help you unwind! All in a cozy and casual setting. A shiny venture of camaraderie: meet old friends and make new once opportunity. Special thanks to the organizing committee: Ms.. Marivic Mizushina, coordinator ; Mr. Roel Sison, secretary ; Ms. Leonida Naruke, finance; Ms. Eutemia Ebato and Ms. Filomina Sekiguchi, receptionist and registration ; Ms. Mary Grace Sato, foods; Mr. Mitsunori Mizushima, Mr. Nilo Ibasco and Mr. Hector Vesillas, technical and physical arrangement.